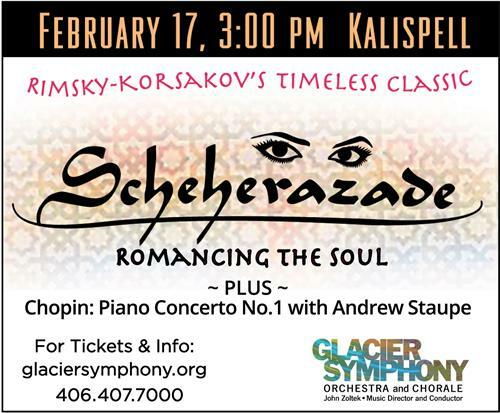 Continue your Valentine’s Day experience with the Glacier Symphony’s “Romancing the Soul” concert Sunday, February 17 at 3:00pm in Kalispell. The Symphony, under the direction of Maestro John Zoltek, will offer “Scheherazade,” the dynamic and colorful orchestral suite by Russian composer and master of orchestration, Rimsky-Korsakov. Considered to be one of the most popular showpieces of classical music, the gorgeous melodies, exotic orchestral colors and vibrant rhythms transport you to the imaginary world of “One Thousand and One Nights” upon which the musical work was inspired. Special Discount for Kalispell Chamber members. $20 seating in tier 2 section. Call the Glacier Symphony Box Office and tell them you are a Kalispell Chamber member.